I'm teaching my creative writing class to write fiction, now. This quarter, they start writing a novel. I know it is a novel that most of them will never finish, but the least I can do is to give them a push in the right direction. As part of my plan, I am showing them two movies. They have read novels, but, for my purposes, the movies I have picked (Dances With Wolves and To Kill A Mockingbird) are effective in having them explore novel-style story structure. 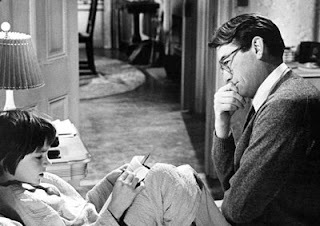 Today, we started talking about To Kill A Mockingbird, which they have all read at some point or another (way too early, as per the ridiculous and ubiquitous assumption that it is a book that kids are intellectually ready for simply because kids are the main characters), and I had an epiphany. I stopped the lesson. I paused the film after Atticus hugs Scout good night. I told the girls that I wasn't talking to them for the moment. They laughed. I addressed the guys. "Gentlemen," I said. "I am about to teach you the most valuable lesson of your life. I am about to give you a direction -- a goal to achieve; a task that will answer every question concerning what it takes to be a real man. I am about to give you a bit of advice that will make you the desired companion of wonderful women; the guy guys want to be; the best dad in the world; an important and meaningful person. You want die and leave behind a legacy of change and positive influence? You want people to remember you as a fellow whose mere presence made their life better? You want to be a man? Become Atticus Finch." Though it wasn't in the lesson plan, I stand by that remark. For so many reasons. I hope it's not too late for me.